Universal Design (UD) does not equate to accessibility design even though they both are concerned with ergonomics and human function issues. The ADA guidelines for accessibility were created as a means to help those people with extreme disabilities within our society who are a narrow and specific cross section of the masses. A UD approach broadly takes into account moderate impairments or disabilities, temporary health conditions, and the varying abilities of anyone within a home regardless of their age or size. In other words, an ADA accessible home would be designed for the one person with the disability whereas a UD home is designed for everyone. Features like single-story design, bedrooms and bathrooms on the ground floor, natural day lighting through larger windows and skylights, and wider doors and hallways appeal to users of all ages. With baby boomers eyeing a future where they'll age in place and younger people renovating older homes, the Harvard Joint Center for Housing Studies is anticipating healthy growth for the U.S. home improvement market through 2025. The new evolving concept known as Universal Design for home building and remodeling is catching on nationwide and has been for several years as a sign of the times. Universal design techniques used in building makes a home more accessible to all regardless of their mobility or adaptive abilities. An evolution of new products used for disability home modifications is making those homes more accessible and has finally come about in the remodeling industry. These new advances in accessible home remodeling not only keep the living environments safer but will not compromise the home's aesthetics. This new way of thinking offers flexibility to add accessories now and later to those planning ahead or to the end user. It also provides for a wide range of human performance characteristics for the way people use spaces within their homes including well integrated usability features. These adaptations have a broad market appeal to everyone for achieving ease of use, safety, and convenience accommodating a certain reality. That reality is that all people exist along a continuum of human performance as per their personal traits and characteristics regardless of their age. A universal approach to design takes into account that everyone has varying degrees of ability and disability rather than someone is either fully-functional or disabled. A universal design is appealing to all users. The seven criteria which must be met to be considered a universal design no matter which area of the home you are referring to are: Any design must be equally useful to everyone, have flexibility in usefulness, be simple and intuitive, be perceived by everyone, have a tolerance for error, require little physical effort, and it must maintain an adequate area for approach and use. Any complexity or discriminating attribute to a design will doom it in terms of being considered universal in nature. While each ind­ividual will have different needs and wants, there are many ways to make homes more user friendly or accessible. Having the ability to enter the home from the outdoors is one of the first steps to enjoying a home. Once inside, the overall layout of the home can make a significant impact on the convenience and usability of the home. 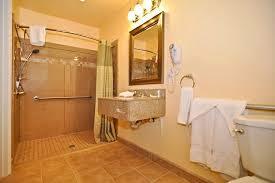 Universal design principles recommend a bedroom, kitchen, entertainment area and a full bathroom on the main floor. Finding a professional with the expertise to design, build or remodel a home to be handicap accessible might seem overwhelming. One place to start is by looking through the selection of Certified Aging-In-Place Specialists. This designation program, offered through the National Association of Home Builders, incorporates components of assessment, technical knowledge and management skills related to home modifications that will allow people to stay in their own homes safely and independently for a longer amount of time. If you believe you are located at the perfect address, and you have a new member in your family or are simply a multi-generational family of today taking care of a parent and you find yourself short on living space then give us a call. Inevitably at one time or another all homeowners envision potential improvements to an existing home that can significantly enhance their living experience. Regardless of the reason you require home modifications we can help you to transform the functionality of your existing living situation or add additional living space to suit your present family's needs. Fall in love with your home again while the professional remodeling contractor's experience helps guide you through changes to your existing home which better fit your daily lifestyle. It's time to find yourself either a qualified architectural firm and proceed with the endless task of interviewing residential remodeling contractor or a local design/build construction company with in house design capabilities that can build what is designed. The latter situation is usually your best shot at getting what you basically need to solve your living situation problems allowing you to cut out the beyond budget frills. You will also save on the soft costs of your construction project that have nothing to do with the structural building process itself. Many local residential contractors are quite capable of pushing out a wall in your home or putting a top on a new structure. This capability is based on both their experience and knowledge of all the building trades, especially the framing aspect that will certainly be involved. Actual experience in this particular facet of the project could prove to be very helpful for visualizing the construction and it's possibilities. Has this contractor ever done this kind of project before? Does he himself have skilled experience or does he appear to be a drive by limited contractor at the mercy of his subcontractor's capabilities? Any depth of design is totally based on experience. You will need to completely check out the contractor's references. Don't be taken in by paid contractor listings and referral sights that promise you successful and competent businesses with free background checks. They were listed there for one and only one reason, somebody paid for the listing fee. Membership to national associations like NARI reflect only a self paid fee but says nothing about the contractor's experience and creativity. That only comes from past customer's testimonials that you can fact check through the local BBB, Yelp, or Houzz. T-Square Company originally came into being as a remodeling company driven with the purpose to maximize the potential of existing homes. When updating elements of functionality, style, efficiency, accessibility, and comfort, a home can be brought into your present day needs and desires of it's occupants. We approach complete home remodeling, renovations, and additions with the same targeted mindset using universal design techniques to build for the future. With our CAPS training, we are able to offer accessible home designs and modifications for our clients with special needs or disabilities. If you have contemplated and dreamed of an addition to your home for years and now find it's time to make a decision to move forward let us help you. Certain changes in your lifestyle may have dictated an expansion. Your living space has grown more crowded over time with additional family members being added as children, extended family members, or an elderly family member. Any and all of these life changing situations can add stress to your daily lifestyle creating the need for additional living space or home improvements in Austin. As our children grow older they generally require more space and sometimes privacy. This sparks a need for an additional bedroom space once an aging relative or spouse requiring special care is introduced into the original home's square footage. Privacy can truly become an issue if only to keep everyone happy while underneath the same roof. Perhaps even private entrances will be required for some of the home's new residents. These private entries could be required to begin a new accessible route if there are ADA compatibility issues involved. T-Square Company is a local design/build General Contracting firm registered with the City of Austin, Texas. We have a competent team of in house craftsmen for your structural job aspects. 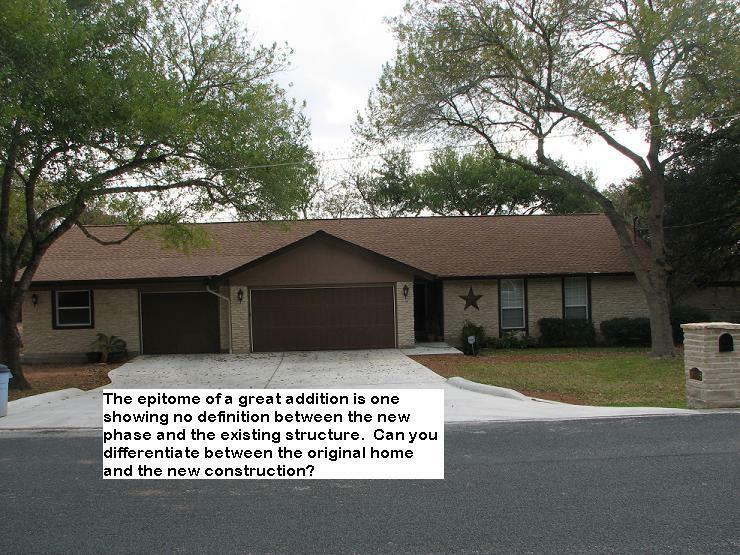 They are complemented by a force of long time affiliated subcontractors holding a masters license with the State of Texas. We are certified accessibility experts holding nationally accredited CAPS and Universal Design (UD) certificates to assist in removing any architectural barriers limiting mobility within your home. 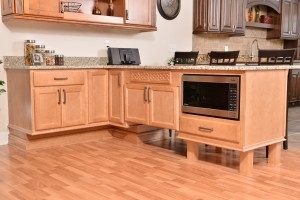 We offer complete home modifications for independent living for our aging in place customers in Austin. Let us show you how to adapt your home to fit your ever changing accessibility needs. Perhaps an expansion to a defined living space would solve a changing living situation. How can this be accomplished without altering your home's basic footprint? How can you go about this without a costly addition? Maybe it's time to look under the hood, so to speak, for a solution that is right under your existing homes roof line. How about pushing a certain room's perimeter out into your existing unused attic space to create attic remodeling? You can expand a small child's bedroom space to create a play or activity room. Storage needs can be met by taking in part of the attic to create a closet or other additional storage area. Entertainment areas can be created without taking square footage out of the living space once the equipment is installed beyond the existing inner wall line into the attic space. How you accomplish adding this additional square footage can be quite easy if you obtain the advice of a qualified building professional. 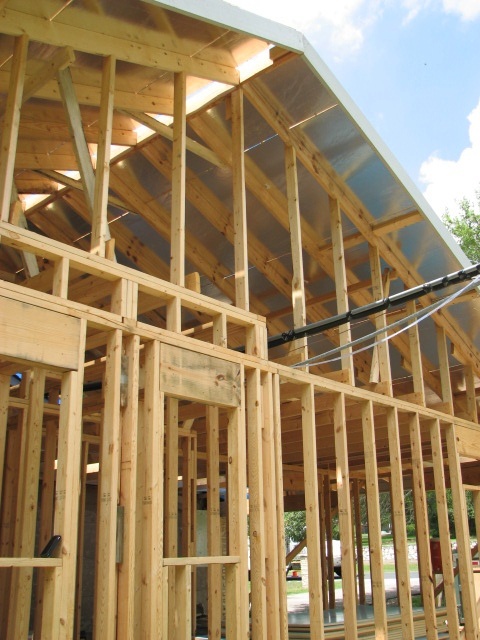 Any reputable residential building contractor can give you direction for such a task so that your roof's structural integrity is not put in jeopardy. You must not under any circumstance interrupt the structural balance of your roof. Not only could you cause a structural failure of the roof itself but other areas of your home could be affected by this interruption in stability. Whatever your situation please rely on the experiences of a local building professional. Check out their credentials and references over merely price checks against other bidders. Don't make the mistake of letting a cabinet making subcontractor play the part of a general contractor because his knowledge will be limited to that of the cabinets and not much else. You get what you pay for with proper planning. Call T-Square Company today at 512-444-0097 for a complete design/build experience for the home remodel or addition you've longed for. The aging in place phenomenon or movement is characterized by the needs and wants generated by an aging society of homeowners. People age differently because the aging process is based on their individual genetic makeup, lifestyle, and environment. These three factors combine to drive the need for Universal Design within the Aging In Place market. People's personal needs vary with age and the Universal Design of products, services, and environments provide adaptations for aging in place to everyone regardless of their age, ability, or situation. Universal Design becomes invisible when incorporated into a home remodel and is present when help with accessibility is needed. 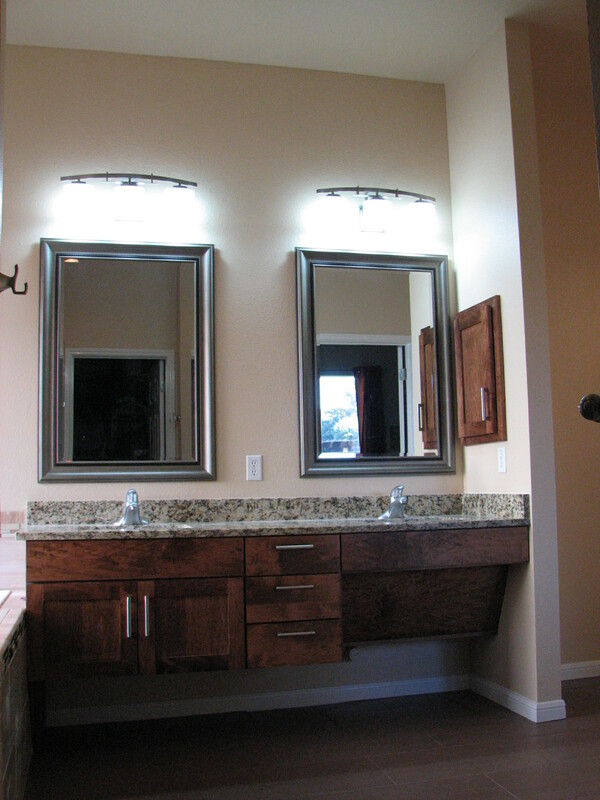 Furthermore, an appealing universal design project creates a greater resale potential. Aging in place construction provides immediate accessibility while universal design techniques provide for accessibility now and when needed in the future. We know that 36% of the nation's housing stock owned by people at age 50 and over was built before 1960. This group represents the most appreciated value in the housing market which may become a separate problem within itself. These homes will have to be adapted the most for the inhabitants requiring aging in place services since they preceded the idea of Universal Design and also involve more general maintenance. Aging in place is all about living independently for as long as possible within your existing home, neighborhood, and community. It is also about being safe and healthy within your home which has had architectural barriers or dangerous areas removed using proven practical home modifications. Trained and certified CAPS professionals are working throughout the residential remodeling industry demonstrating how you can age in place with the greatest freedom of movement and maneuverability. Aging in place home design is a concept promoting independence and livability for all types of living environments no matter the age or level of abilities of the occupants. The principle is not entirely age related as recuperation periods from injuries or the progression of debilitating diseases like MS or ALS can happen to anyone at any age. Home modifications for aging in place should include adding non-slip flooring, widening hallways or installing stair lifts, and widening doors. You might also consider lowering light switches and thermostats and installing easier to use door knobs. Many considerations for an aging in place design should be taken into account to provide safety and independence. You should try to provide a clear barrier free path or accessible route to the most visited areas of your home as recommended by the ADA. The three areas needing improvement for a person wanting to age in place include the bathroom, the kitchen, and the family area in order of importance. 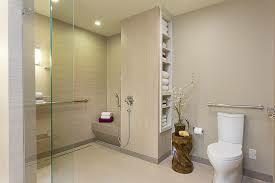 The alterations in these specific areas are essential for the accessible homes of Austin. The goal of an accessible bathroom design in Austin is to make the bathroom a safe space for everyone who uses the facilities. Aging in place services use universal design to accommodate wheelchair use and can make the bathroom more comfortable for all generations with or without specific needs. 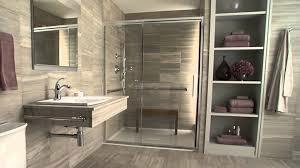 It is important to carefully outline the scope of work during the remodeling of an accessible bathroom by first taking inventory of the users capabilities, needs, and preferences. 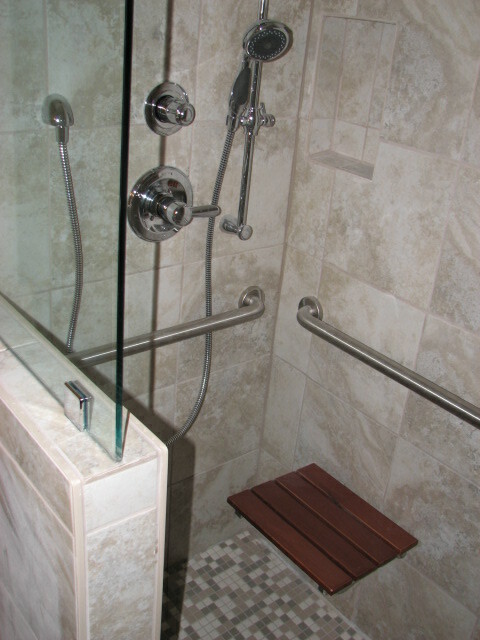 All disability home remodeling or disability bath remodels in Austin must be done considering all the data provided by the client, his or her family, and any caretakers involved. Aging in place design must be carried out by an aging in place specialist.